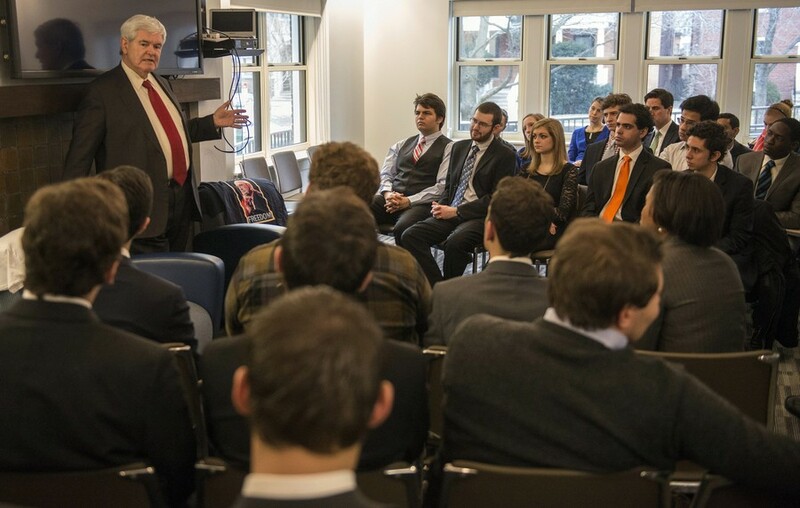 Newt Gingrich met with the College Republicans club at the IOP in 2013. The College Republicans (CR) club at the University of Chicago is unlikely to endorse Republican presidential nominee Donald Trump, according to CR’s president, third-year Matthew Foldi. Foldi will not propose a statement of endorsement for Trump to the club's executive board. Foldi plans to propose an endorsement of Republican Mark Kirk for the Senate, and thinks he’ll likely have unanimous support from the board to endorse the Illinois republican in his reelection campaign. Asked whether deciding not to propose an endorsement of Trump means that the club is implicitly expressing disapproval of its party’s nominee, Foldi stated that in past election cycles, CR has not endorsed a presidential candidate. The executive board endorsed Dean Ellison’s letter to first-years condemning safe spaces and trigger warnings. Foldi proposed the statement on the Ellison letter to the executive board, and the board unanimously agreed to issue the endorsement. In recent weeks, CR clubs at some colleges have released statements announcing their lack of support for their party’s nominee. Other clubs have endorsed Trump. On August 4, Harvard CR stated that it would not endorse Trump. On August 8, Yale CR endorsed Trump. Later that day, Princeton CR said it would not endorse Trump. On September 2, Cornell CR endorsed Libertarian candidate Gary Johnson. CR clubs have used a variety of methods to determine whether or not to endorse Trump. Some clubs have polled all of their members and let the majority decide. At other schools, the leadership or executive boards have been responsible for the decision. At Yale, the club’s co-directors made the decision themselves. Foldi said that members would not be polled for a possible endorsement because it would be difficult to get unanimous support for any candidate. Most members did not support Trump in the Republican primary: CR held a mock primary in February before the New Hampshire primary election, and Trump finished behind former Virginia governor Jim Gilmore, who consistently polled at less than one percent. CR executive board members Chelsea Smith, Brett Barbin, Joshua Parks, and Ernesto Ambrocio did not respond to requests for comment on whether there have been discussions about a possible Trump endorsement. Former executive board member Steven Yaffe also did not respond to a request for comment. The University of Chicago Democrats club does not endorse candidates during primary campaigns, but there was never any question as to whether it would endorse the Democratic nominee: The club shared a Hillary Clinton Facebook post on July 26, the day Clinton officially secured the Democratic nomination, and added the caption “We have a nominee!” The club’s president, Rachel Neuburger, confirmed the endorsement in an e-mail to The Maroon. A previous version of this article incorrectly stated that Foldi is a second-year. A previous version of this article incorrectly stated that Yaffe is currently on the club's executive board.